This little tree takes under an hour to make and I've made several this week for Wren & Mr Bump to give to friends as gifts. Instead of felt spots, sew on some beads or buttons as baubles. 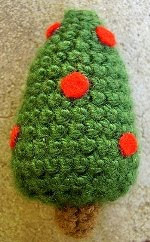 These make a lovely tree ornament too, just add a tie at the top! What lovely ornaments! So cute, and perfect for my children. Like the new look for the blog and really appreciate the xmas patterns!